It is a gonadotropin injection, made of follicle-stimulating hormone (FSH) and luteinizing hormone (LH) from natural sources, which stimulates follicle development and egg maturation. This fertility drug comes in the form of a powder for suspension and is injected subcutaneously for in vitro fertilization (IVF) treatments. 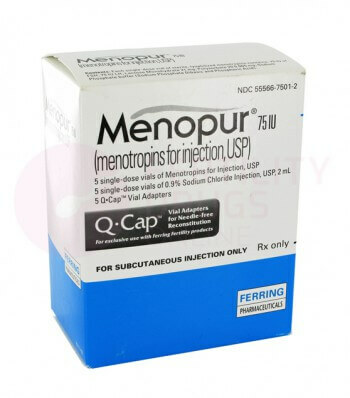 Doctors prescribe Menopur to treat female infertility. Specifically, doctors may prescribe this medication for assisted reproductive technology (ART) treatments such as IVF treatments. The drug can help boost the number of eggs available for harvest, increasing the chance of a successful pregnancy. The injection contains two hormones, FSH and LH, which play a role in the reproductive system. These two hormones help stimulate follicles to grow and mature, increasing the number of eggs available. Once these eggs are released from the ovaries, possibly with the help of human chorionic gonadotropin (hCG) shots, they can either be harvested for use in IVF treatments or fertilized naturally by sperm. Your doctor will give you directions on how and when to take this medication, and you can also refer to your product leaflet for more information. First, check the solution for particles and cloudiness, and only use the solution if it is clear. Wash your hands with soap and water and use alcohol to clean the injection site. Then, use the special Q-Cap mixing cap to mix the Menopur powder with the solution. Inject the drug subcutaneously, which is under the skin, and properly dispose of any unused medication, the needle and syringe, and any other used medical supplies when you are done. Try to vary the injection location each day to reduce skin irritation, and try to take your shot at the same time each day. You may be injecting 75 to 150 IU, or up to 450 IU, of this medicine each day for up to twenty days, but always follow your doctor's dosing instructions precisely. If you miss a dose of Menopur, do not double dose; contact your doctor for instructions. Keep this drug, needles, and syringes out of the reach of children, and never reuse needles and syringes. The drug may increase the risk of an ectopic pregnancy, which is when the baby develops outside of the womb, and multiple births, such as twins. This remedy can increase the risk of ovarian torsion, cutting off blood flow to the ovary, and the risk of tumors in your ovaries is higher if you use the medication for more than one pregnancy. Do not use this medicine while pregnant because this drug may harm the fetus; contact your doctor immediately if you believe you may be pregnant. Researchers are unsure if Menopur can be transmitted in breast milk, so discuss with your doctor before breastfeeding. Your doctor may perform ultrasounds to check for enlarged ovaries, along with other tests such as hormone and pregnancy tests. Your fertility doctor may prescribe Menopur on its own or in conjunction with in vitro fertilization (IVF) treatments. Since this drug stimulates follicles, your doctor may prescribe a human chorionic gonadotropin (hCG) injection as well to release the eggs. You may also use an ovulation test to determine when you are ovulating and the best time to conceive. In vitro fertilization treatments (IVF treatments) are a type of assisted reproductive technology (ART) that help women conceive when they have infertility. Fertility doctors usually prescribe drugs to stimulate ovulation, which increases the number of eggs available for harvest by the IVF technician. When they remove these eggs, the technicians then fertilizes them with sperm in the laboratory. After the fertilized egg, now called a zygote, grows for two to six days, the IVF technician will implant the zygote or zygotes into a woman's uterus. If all goes well, the zygote grows and the woman will give birth to a healthy baby about nine months later. The cost of IVF and fertility treatments can add up, especially with expensive fertility drugs, making parenthood seem out of reach for some couples. To help make fertility more affordable, we aim to help you order affordable Menopur 75 iu injection. The first step is to discuss with your fertility doctor which fertility drugs are best for you and your medical needs, then once you have a prescription for this medicine, bring it back to us to place your order by phone or online. We send your prescription and medical information to one of our partner pharmacies, who will then ship your affordable Menopur, so you can boost your ovulation for the best chance at a successful pregnancy.